Camping without a campfire sounds like swimming without water to some people. Half the reason to go camping is to sit around the group fire at night enjoying the gorgeous night air & good conversation. Here in California we have many fire restrictions in place, especially in Southern California. With the expanding population moving in to the state, we now have less rural lands available than ever before. Current ongoing drought conditions in much of California means tight restrictions on campfires - inside and outside of campgrounds. Late Summer to Autumn season campfire restrictions can apply to backpacking in the high country, back roads dispersed camping, and sometimes even regular campgrounds. When wildfire danger is greatest no campfires are allowed anywhere in the forest, even inside developed campgrounds. Our over-managed forest lands, with drought, bark beetles infestation and rapid fire cycles, and limited fire crews - burn thousands of acres each year. When wilderness areas get closed off & dirt road routes get overgrown, no one can access them - not even fire trucks or emergency personnel. 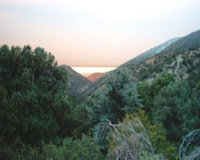 Half the forest easily can ignite like the 2006 Day Fire in Los Padres that lasted well over a month. 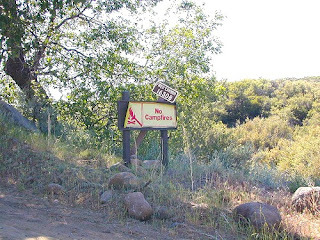 Many developed campgrounds are not even allowing campfires during the dry season. Can you blame them? We all know California is prone to wildfires. Learning to camp without a campfire can be a challenge, so we're here to help. What is there to do at night without a campfire? 3.) Off Roading - Night Run! Lynn from Frazier Park captured this surreal shot looking north into the great Central Valley with the eerie smoke & sunlight during a frequent wild fire season.